About this objectThis cannonball is one of the last shots fired in the Taranaki Land Wars. 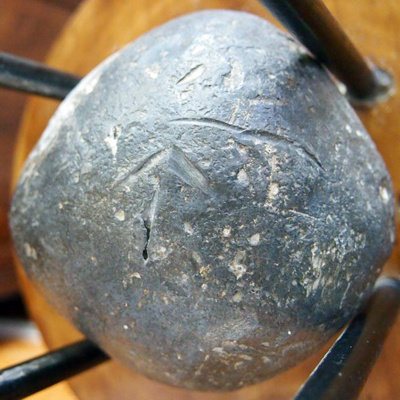 The story of this cannonball is strongly linked to the story of the taiaha in the Taonga Māori section of the Mokau Museum. Hone Wetere, who owned the taiaha, was pursued up the Mokau River by government forces in the early 1870s. The boat pursuing him paused as it passed the small Māori settlement on the banks of the river, where the town now stands, and fired on it three times with their on-board cannons. Fortunately nobody was hurt. One cannonball fell into the river, another was found and used as a doorstop for years before being dropped down a well, and this final one was discovered in the garden of one of our museum's volunteers. This cannonball marked the end of artillery in the Taranaki Land Wars. Measurements4 1/2 inch (12 cm) dia.